Lime Simple Syrup Directions: In a small saucepan, combine the sugar, water, lime juice, and lime zest over medium heat. Bring to a boil, reduce heat, and simmer for about 5 minutes, stirring occasionally, until the sugar has dissolved. Remove the pan from the heat and allow the syrup to cool to room temperature minutes before using. 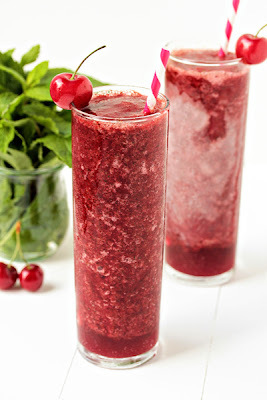 Directions: Place the frozen cherries, ice, mint, rum, and lime simple syrup in a blender. Blend until smooth. Pour the mixture into glasses and top with crushed ice. Garnish with lime wedges and cherries. - You can also try vodka instead of rum...or...make these alcohol free! - Recipe adapted from Giada De Laurentiis.